The 2018 finalists of Gradam Sheosaimh Uí Ógartaigh were officially announced this week by the Mayor of the City of Galway, Cllr. Pearce Flannery at a press event in Téatar Uí Chearbhalláin, Áras na Gaeilge, NUI Galway. Fifteen Galway-based businesses and organisations from a variety of sectors were named on this year’s Gearrliosta, all who have made the Irish language an integral part of their story. The Moltóirí were impressed by everyone’s bilingual efforts and their commitment to the Irish language, but what really stood out in the businesses selected for the Gearrliosta, was that progress can be seen and measured from previous entrants and the standard of the new entrants to the Gradam is quite high. 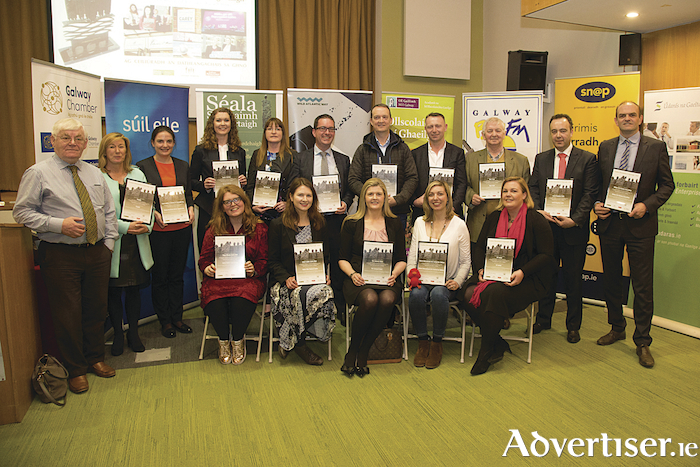 Gaillimh le Gaeilge has organised Gradam Sheosaimh Uí Ógartaigh, for the past 16 years in association with the Galway Advertiser and with support from the Galway Chamber, which celebrates the outstanding efforts of the business community in Galway that use the language in their business. Also, at the event, the President of NUI Galway, Professor Ciarán Ó hÓgartaigh, launched ‘Duais Aitheantais Pheadair Uí Fhlatharta’ on behalf of Bord Stiúrtha Ghaillimh le Gaeilge in association with ‘Fiontar & Scoil na Gaeilge’, DCU. Peadar was the first Cathaoirleach and funding member of Gaillimh le Gaeilge and he laid down the foundation for the growth and success of the organisation. A beautiful piece of sculpture was especially designed by the renowned artist Pádraic Reaney, a good friend of Peadar. It will be presented to a person or an organisation who have made a great effort to use the Irish language but who are not involved primarily involved with the work of Gaillimh le Gaeilge or indeed Gradam Sheosaimh Uí Ógartaigh. Bord Stiúrtha Ghaillimh le Gaeilge will choose the nominees and it will be presented for the first time at the presentation of Gradam Sheosaimh Uí Ógartaigh 2018 in late May. After the announcement of ‘Duais Aitheantas Pheadair Uí Fhlatharta’, the Mayor of the City of Galway, Cllr. Pearce Flannery presented a certificate to all of the businesses on the Gearrliosta and he praised their work using the Irish language in the city. Aunty Nellie’s Sweet Shop, High Street, Corrib Shopping Centre, Eyre Square, KD Autoparts, Ballybane, Kennys Bookshop and Art Galleries Ltd., Liosbán. 56 Central, Shop Street, Harbour Hotel, New Dock Road, The Connacht Hotel, Dublin Road. Big O Taxis, Eyre Square, Colm’s Life Pharmacy, Salthill, Galvia West Medical Centre, Westside, Swaine Solicitors, Knocknacarra, Sweeney Oil, Headford Road. Baboró, International Arts Festival for Children, Merchant’s Road, Galway City Business Association, Francis Street, iSupply, Sea Road. Cathaoirleach Ghaillimh le Gaeilge, Bernadette Mullarkey congratulated all of the businesses on the Gearrliosta and praised their efforts strenghtening the cultural bilingual brand of the city. She also thanked all of the local and national sponsors of the Gradam: The Galway Advertiser, TG4, Fáilte Ireland, Galway Bay FM, Snap Galway, Acadamh na hOllscolaíochta Gaeilge, Ollscoil na hÉireann, Gaillimh, Lorg Media, Údarás na Gaeltachta and the Galway Chamber for their support. The total value of the sponsorship package for the Gradam is worth in excess of €23,000. Cathaoirleach Gaillimh le Gaeilge thanked the Moltóirí Ghradam Sheosaimh Uí Ógartaigh who will visit the premises of all of the finalists next week. They are: Aelmuire Ní Ógartaigh, Freda Nic Giolla Chatháin, Gnó Mhaigh Eo, Judy Ní Dhubháin, Údarás na Gaeltachta and Irial Ó Ceallaigh, TG4. The Minister for State at the Department of Culture, Heritage and the Gaeltacht, Joe McHugh TD will announce the category winners and overall winners of Gradam Sheosaimh Uí Ógartaigh 2018 at a special ceremony on May 24 in the Salthill Hotel.